This selection of six issues from one of Vertigo's longest running series brings together a few of the morally ambiguous stops on John Constantine's journey through the bleak heart of humankind. The episodes, originally published from 1988 to 1994 and reprinted here for the first time, begin with Constantine's bitter memory of a time "before hell impaled and toasted us, writhing over the roaring fires of our own inadequacies." The series is legendary for its combination of political cynicism, magical exploration and occult horror. Constantine bends demons to his will at times, gets trounced by them at others, and always wonders if he and the rest of humanity are worth the effort. 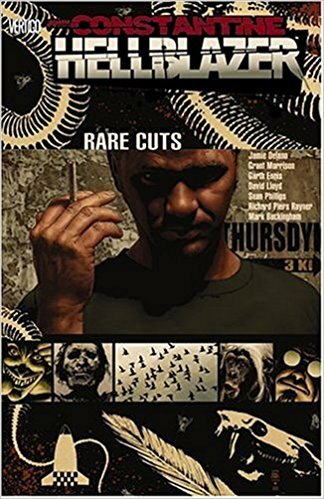 Marvelous storytelling from three of the series' best writers-Delano, Ennis and Morrison-will make the collection hard to resist for fans and a great way in for new readers. Morrison's two tales, "Early Warning" and "How I Learned to Love the Bomb," are especially riveting as a parade of suppressed human desires released by a combination of nuclear frequencies and pagan ritual threaten Constantine. Hyper-realistic art by Lloyd, Philips, Rayner and Buckingham gives powerful expression to the varied horrors of demonic force and human weakness. A timeline and map of "Constantine's London" at book's end is an appealing bonus.